This page will list the publications on Qumran by the network members, from year 2003 onwards. The Orion Center is requesting that all Qumran scholars check the Orion Website Bibliography for relevant articles (2000 onwards, but also earlier if important things are missing). Please send additions and corrections to msdss@mscc.huji.ac.il. For publications in other languages than English, it is also helpful to include an English title and to state the original language. Bengtsson, Håkan. "Kvinnor i Qumran, en fråga om text eller kontext?" [Women at Qumran, a question of text or context?] Svensk Exegetisk Årsbok, 68/2003, 135-153. Bro Larsen, Kasper. "Dødehavsrullerne - historien fortsætter" [The Dead Sea Scrolls: the Story Goes On]. Feature article in Jyllands-Posten, July 15th 2003, 1st section, p. 7. Ejrnæs, Bodil. "David, Salmernes Bog og konstruktionen af messias i Dødehavsskrifterne." [David, the Book of Psalms and messiah in the Dead Sea Scrolls.] Pages 79-98 in Frelsens biografisering. Edited by Thomas L. Thompson and Henrik Tronier. Forum for Bibelsk Eksegese 13. Copenhagen: Museum Tusculanum, 2004. --. "Det Gamle Testamente som Skrift: Skrift og autoritet." [Old Testament as Scripture: Scripture and Authority.] Pages 31-47 in (eds. ), Kanon: Bibelens tilblivelse og normative status (Festschrift for Mogens M&uumÃļ;ller). Edited by Troels Engberg-Pedersen, Niels Peter Lemche, and Henrik Tronier. Forum for Bibelsk Eksegese 15. Copenhagen: Museum Tusculanum, 2006. --. "Dødehavsskrifterne og de antikke kilder om essæerne." TEOL-Information 29 (2004): 45-46. --. "'Jeg husker dig for din velsignelse, Zion ...'. Zionmotivet i en salme fra Qumran." ['I remember you for blessing, Zion ...': The Zion motif in a psalm from Qumran.] Pages 115-128 in Historie og konstruktion. Festskrift til Niels Peter Lemche i anledning af 60 års fødselsdagen den 6. september 2005. Edited by Mogens Møller and Thomas L. Thompson Forum for Bibelsk Eksegese 14. Copenhagen: Museum Tusculanum, 2005. --. "Lidelse, redning og indsigt i Hodajot, salmerne fra Qumran." [Suffering, salvation, and knowledge in Hodayot, psalms from Qumran.] Pages 88-106 in Lidelsens former og figurer. Edited by B. Ejrnæs and L. Fatum. Forum for Bibelsk Eksegese 12. Copenhagen: Museum Tusculanum, 2002. Ejrnæs, Bodil, Søren Holst & Mogens Møller (ed.). Dødehavsskrifterne og de antikke kilder om essæerne. 2. enlarged and revised edition. Frederiksberg: ANIS, 2003. 615 pages. Elgvin, Torleif. "4Q413 - A Hymn and a Wisdom Instruction." Pages 205-14 in Emanuel: Studies in Hebrew Bible, Septuagint, and Dead Sea Scrolls in Honor of Emanuel Tov. Edited by Shalom M. Paul, Robert A. Kraft, Lawrence H. Schiffman, and Weston W. Fields. Leiden: Brill, 2003. --. "4QMysteriesc: A New Edition." Pages 75-85 in From 4QMMT to Resurrection: MÃŠlanges qumraniens en hommage à Émile Puech. Edited by Florentino García Martínez, Annette Steudel and Eibert Tigchelaar. STDJ 61. Brill: Leiden, 2006. --. "Different Bibles for Different Groups?" Pages 408-13 in Enoch and Qumran Origins: New Light on a Forgotten Connection. Edited by G. Boccaccini. Eerdmans, 2005. --, (ed.). Dødehavsrullene. Verdens hellige skrifter. Oslo: De norske Bokklubbene, 2004. --. "Dødehavsrullene og Bibelen." Religion og livssyn 1/2003: 9-14. --. "The Eschatological Hope of 4QTime of Righteousness." Pages 89-102 in Wisdom and Apocalypticism in the Dead Sea Scrolls and the Biblical Tradition. Edited by F. García Martínez. Leuven: Peeters, 2003. --. "The Individual Interpretation of the Servant Songs." Mishkan 43 (3/2005): 25-33. --. "Priestly Sages? The Milieus of Origin of 4QMysteries and 4QInstruction." Pages 67-87 in Sapiential Perspectives: Wisdom Literature in Light of the Dead Sea Scrolls. Edited by J. J. Collins et. al. Leiden: Brill, 2004. --. "Qumran and the Roots of the Rosh Hashanah Liturgy." Pages 49-67 in Liturgical Perspectives: Prayer and Poetry in Light of the Dead Sea Scrolls. Edited by E. G. Chazon. Leiden: Brill, 2003. --. Review of C. M. Murphy, Wealth in the Dead Sea Scrolls and in the Qumran Literature. Journal of Semitic Studies 49 (2004): 348-51. --. "The Yahad Is More Than Qumran." Pages 273-279 in Enoch and Qumran Origins: New Light on a Forgotten Connection. Edited by G. Boccaccini. Eerdmans, 2005. Elgvin, Torleif, and Michaela Hallermayer. "Schøyen ms. 5234: Ein neues Tobit-Fragment vom Toten Meer." 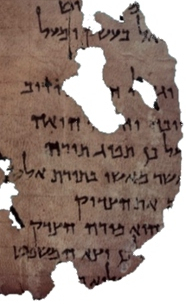 Revue de Qumran 22 (2006): 451-460. Elgvin, Torleif, and Ian Werret. "4Q472a in Infrared Light: Latrine Manual Down the Drain." RevQ 23 (2007): 109-116. Høgenhaven, Jesper. "Rhetorical Devices in 4QMMT." Dead Sea Discoveries 10 (2003): 187-204. --. "Fortællinger fra det persiske hof (4Q550) - en Qumran-udgave af Ester-historien?" Dansk teologisk tidsskrift 67 (2004): 15-34. --. "Esajas-kommentarerne fra Qumran: Struktur, genre og terminologi" Dansk Teologisk Tidsskrift 70 (2007): 64-82. --. "The Literary Character of 4QTanhumim" Dead Sea Discoveries 14 (2007): 99-123. Holst, Søren. "Abraham at Qumran." Pages 180-191 in Historie og konstruktion. Festskrift til Niels Peter Lemche i anledning af 60 års fødselsdagen. Edited by M. Müller and Th. L. Thompson. Forum for Bibelsk Eksegese 14. Copenhagen: Museum Tusculanum, 2005. --. "Dødehavsrullerne på 60° nordlig bredde." TEOL-information 28 (2003): 30-33. --. "Folkenes og troens stamfader: Abraham i Det Gamle Testamente og i jødedommen." Pages 11-36 in Abrahams spor: Abraham-figuren i religion, filosofi og kunst (Religion i det 21. Århundrede, vol. 16), København: Alfa, 2007. --. "Hvem dræber Messias?" Bibliana 1/2004: 55-58. --. "'Hvem er som jeg blandt guder?' Hymner om himmelfart og læreautoritet fra Qumran." Pages 26-46 in Frelsens biografisering. Edited by H. Tronier and Th. L. Thompson. Forum for Bibelsk Eksegese 13. Copenhagen: Museum Tusculanum, 2004. --. "Hvilke Dødehavstekster er 'sekteriske'?" Dansk Teologisk Tidsskrift 66 (2003): 18-31. --. "Hvis er Himmeriget?" Dansk Teologisk Tidsskrift 70 [Festschrift for Bodil Ejrnæs] (2007): 93-102. --. "'Lysets Børn' - på krigsstien eller i lærehuset? Om Dødehavsruller og genrespørgsmål." Fønix 28 (2004): 45-58. Holst, Søren, and Bodil Ejrnæs. "Hvad nyt fra rullerne?" TEOL-information 35 (2007): 16-19. Holst, Søren, and Jesper Høgenhaven. "Physiognomy and Eschatology: Some More Fragments of 4Q561." Journal of Jewish Studies 57 (2006): 26-43. Jokiranta, Jutta. "Pesharim: A Mirror of Self-Understanding." Pages 23-34 in Reading the Present: Scriptural Interpretation and the Contemporary in the Texts of the Judean Desert. Edited by Kristin de Troyer and Armin Lange. Atlanta, GA: SBL, 2005. --. "Qumranin yhteisö ja sosiologisten mallien kÃÂ¤yttökelpoisuus." [Qumran Community and the Usability of Sociological Models.] Teologinen Aikakauskirja 109 (2004). --. "Uuden Qumran-teorian ongelmia." [Problems of a New Qumran Theory.] Teologinen aikakauskirja 108 (2003): 253-256. Justnes, Årstein. "4Q215a (Time of Righteousness) in Context." Pages 141-70 in Sapiential Perspectives: Wisdom Literature in Light of the Dead Sea Scrolls. Edited by J. J. Collins et. al. Leiden: Brill, 2004. Körting, Corinna. "Theology of Atonement in the Feast Calendar of the Temple Scroll - Some Observations" Scandinavian Journal of the Old Testament 18 (2004): 232-47. Lied, Liv I. "Another Look at the Land of Damascus: The Spaces of the Damascus Document in the Light of Edward W. Soja's Thirdspace Approach." Pages 101-126 in New Directions in Qumran Studies. Edited by J. G. Campbell et al. London: T & T Clark, 2005. --. The Other Lands of Israel: A Study of the Land Theme in 2 Baruch. Doctorate Dissertation, Faculty of Arts, University of Bergen, 2007. (Forthcoming in Supplements to the Journal for the Study of Judaism. Leiden: Brill, 2008). Riska, Magnus. The House of the Lord: A Study of the Temple Scroll Columns 29:3b-47:18. Publications of the Finnish Exegetical Society 93. Helsinki: Finnish Exegetical Society, 2007. --. The Dead Sea Scrolls and the Study of Scripture. Caspari Center, 2007. --. Megillot Midbar Yehudah veLimudei haKtuvim. Translation (by Nava Loden) of The Dead Sea Scrolls and the Study of Scripture. Caspari Center, 2007. Saukkonen, Juhana. "Juutalainen Qumran - harhaa vai oikeaa oppia?" [Jewish Qumran - Heresy or Orthodoxy?] Vartija 3/2003: 88-96. Sollamo, Raija. "War and Violence in the Ideology of the Qumran Community." Pages 341-352 in Verbum et calamus: Semitic and Related Studies in Honour of the Sixtieth Birthday of Professor Tapani Harviainen. Edited by Hannu Juusola, Juha Laulainen and Heikki Palva. Studia Orientalia 99. Helsinki: Finnish Oriental Society, 2004. Ulfgard, Håkan. "The 'Songs of the Sabbath Sacrifice' and the Heavenly Scene of the Book of Revelation." Mishkan 44 (2005): 26-35. Wassen, Cecilia. Women in the Damascus Document. Society of Biblical Literature Academia Biblica Series 21. Leiden: Brill, 2005 (hardback), and Atlanta: SBL, 2005 (paperback). Wassen, Cecilia, and Jutta Jokiranta. "Groups in Tension: Sectarianism in the Damascus Document and the Community Rule". Pages 205-245 in Sectarianism in Early Judaism: Sociological Advances. Edited by David Chalcraft. Equinox Press, 2007. Weissenberg, Hanne von. "4QMMT - Towards an Understanding of the Epilogue." Revue de Qumran 21 (2003): 29-45. Winninge, Mikael. "Judendom och kristendom i konflikt och dialog: Inåt, utåt, då och nu?" Pages 82-95 in Dialoger? Islam, judendom, kristendom och samhÃÂ¤lle. Edited by P.-I. Planefors. Umeå: Stiftelsen Samtidskultur, 2004. --. "The New Testament Reception of Judaism in the Second Temple Period." Pages 15-31 in New Testament as Reception. Papers from a Nordic New Testament Conference in Hillerød, Danmark, 12-16 June 1999. Edited by M. Møller and H. Tronier. Journal for the Study of the New Testament Supplement Series 230. Sheffield: Sheffield Academic Press, 2002.